Now is the time of year for elderflower fritters, a life-long delight in our family and very simple. Enjoy them while you can, the season isn't long. Pick elderflower heads with as many flowers open and as few dead ones as possible. Remove bugs but don't wash them, they're far too delicate. Make a thinish batter and put a couple of inches of oil in a saucepan. Heat the oil until it is hot enough to cook a drop of the batter in about 15 seconds. Hold by the stalk and dunk a head in the batter and twist until it is completely covered. It will clump into a large blob, but don't worry. Lift out of the batter and dunk it in the oil. Twist/spin it slowly as it goes in and it will open out into its original flower head shape. When it starts to brown, remove and put in a paper bag (plastic ones melt) containing sugar and cinnamon. close the top and shake. Remove and enjoy. "Battered Sausage" sound like it should have a definition on Urban Dictionary. ...and as it turns out, it does have an Urban Dictionary definition. I caution everyone against looking it up. Correct me if I'm wrong but according to Wiki Papadums are not fried, but cooked "with dry heat." The deep fried butter gave me a minor heart attack just by reading about it. And it doesn't look that appetizing (see photo in article). Being a product introduced in 2009 is the US and 2011 in Scotland ("Braveheart Butter Bombs") I'm not sure it's a typical dish though. Fried clams - yeah that's a staple, and considered traditional for the New England US coast. Catus Fries... Yes they are Southwestern US, but I'm not sure if typical... yet. You see, most of US' "Southwestern Food" is actually a post 1990's mish mash of haute cuisine and Mexican traditional foods, as the older Mid 20th C "Tex Mex" is a rather crude and extremely limited fast food version of Mexican food , with a few truly traditional plates, like Chili con Carne (aka "Chili"), which is in fact native to Texas just before Texas became independent and a decade later was annexed to the United States. The reason for this "American Southwest" culinary vacuum, is that the Mexican population as well as their culture in the American Southwest - all the way to the Californiia coast, was largely "overrun" in the late 19th. C, when European Americans expanded into the territories taken from Mexico. The Mexican culture was simply substituted by American immigrant’s culture, and thus a lot of truly Southwest cuisine disappeared in favour of more Central European style- depending on the particular region's immigrant ethnicity. Our current "Southwest" cuisine is very much a late 20th. C revival, greatly aided by the 1990s global "foodie culture" phenomenon. Prickly pear, is in fact the fruit of the Nopal Cactus (Opuntia cacti or "paddle cactus"), which is native to Mexico and the American Southwest, and has been exported worldwide actually. Traditionally Americans tend to eat the sweet fruit of the Nopal for desserts only, and not the "paddles," whereas in Mexico the paddles are eaten in salads cold or warm. The paddles are fleshy and tend to be slimy, somewhat similar to the aloe plant extract, so there is some art in cooking the nopal in many permutations to avoid the sliminess of it, cut with onions and aromatics or baked with cheese and chile peppers, etc, etc. So cactus fries, seems to squarely fit in the "Southwest" category, being a post 1990s invention based on Mexican food. I won't comment on the Battered sausage "cultural references"
A relatively old family recipe for fried prickly pear "flats" (the "paddles" of which you speak, Admiral); the recipe is apparently only as old as the invention of the "pear burner," a device utilizing a propane, or the much older pump-type "singeing" torch (which usually used kerosene or much less usually, gasoline), on a long broomstick-like handle, used for burning the spines off of the paddles so that cattle can eat them (and the cattle do eat them, believe it or not; it's a standard practice in drought conditions in south and deep west Texas). The recipe calls for the spines to be burnt off using the torch (a rather laborious and hellishly-hot chore, if one does it in the summer anytime after about 8:30 AM, speaking from personal experience), and then brought either to the campfire or, preferably, in my view, to the air-conditioned oasis of the indoor kitchen and cut into narrow strips, discarding the edges of the paddles as they are apparently/supposedly rather tough. Place the strips between two towels or paper towels or sheets of fabric or what have you, and run a rolling pin over them relatively hard, two or three times. remove the strips from the fabric and drop them into a pot of boiling-hot oil which you will already have prepared and brought to heat before rolling the flat strips (an aged relative's almost verbatim instructions). Let fry for about a minute to two and a half minutes, depending on altitude (apparently in the slightly-higher elevations of regions such as the Davis Mountains and parts of Mexico). Remove from oil and place on a paper towel on a plate to drain; salt to taste and serve. Please bear in mind that I have never tried this recipe, so I can't guarantee it's validity or what taste you will experience if you choose to consume the result. The first one is the traditional way of peeling a Nopal paddle as seen in a market. It usually involves using pliers to remove the large spines and then using a very thin and sharp knife (think a large pairing knife) to remove the small spine clusters, followed by removing the edge around the perimeter and the base of the paddle. Apparently there is also a special spoon with a sharpened slot which helps remove the spine clusters, similar to a vegetable peeler. The second is the modern way. The "Maquinopal" a professional mechanized Nopal peeler invented in the state of Tlaxcala by an old mechatronics engineer. The engineer explains that expert hands (usually female) at the local markets can only peel 5-6 Nopal paddles per minute. The machine can do 20-25 paddles per minute. Modern post 1800 recipes of Nopal dishes abound and are daily fare in Mexico. I'm sure the class of cheese stuffed dishes (such as Chiles Rellenos) date back to at least to the 18th. C upon the influence of non-Hispanic immigration and subsequent 19th C invasions by foreign powers such as France. It looks to me like the same technique used for stuffing hot peppers has been used for Nopales as well. Stuffed Chile pepper dishes usually involve deep frying the stuffed vegetable in an egg batter, and then paradoxically boiling the battered product in a sauce (which to me would just make it soggy, but it's true that most stuffed vegetables follow this pattern of "deep fry and then boil"). Papadum is a thin, crisp, disc-shaped food from the Indian subcontinent; typically based on a seasoned dough usually made from peeled black gram flour (urad flour), fried* or cooked with dry heat. Your bold, my bad I stand corrected. No apologies needed , sorry if I seemed to be telling you off. Potentially julienned and salted flats' fries/chips could go back to the 19th C. Though the first appearance of *potato* fries/chips *in America* only goes back to the 20th C.
But I'm sure Texans consumed Nopal very much the same way other Mexicans did prior to Texas' Independence. Reason being that Nopal would be one of the few foods that the Mexican Northern Frontier would have in common with Central Mexico. Plus Nopal is a Native food, predating the arrival of the Spanish. It seems to me that burning the spines is one way of removing them. Probably as old as anyone could come up with a torch made of rags and oil. It's the julienne part only that makes it a modern era dish. Lángos Hungarian deep fried flatbread. I see it seems to be similar to Native North American "Fry Bread"
I've noticed that coxinhas have already been mentioned (coxinhas are life and coxinhas are love), but you have no idea. 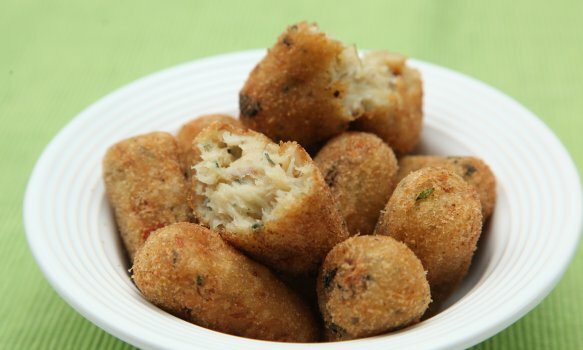 There are coxinhas in the traditional fashion, coxinhas that are a chicken's thigh fried in that dough, coxinhas that are made of things that aren't chicken (like pork sausage, broccoli, and a vegan version made of jackfruit), coxinhas as pizza edges... These aren't the only fried goodies here in Brazil, though. Strap your goggles and seatbelts, adjust your gear and gears, this will be a long ride. The pictures are in spoiler tags for length. You've mentioned acarajés as well, and I'm not familiar enough with it to add or subtract to what has been said. We have pastel - which is different from an empanada. I'm not sure if they came here through Japanese or Chinese immigration. It's a very thin fried dough with filling - it can be sweet or not, but most common are non-sweet fillings. Popular fillings are cheese, ground beef, ground beef and cheese, palm tree core, pizza (cheese, tomato, oregano and an olive), chicken and cream cheese, bauru (cheese, ham, and tomato), pork sausage and cheese, brigadeiro, banana and cinnamon, dulce de leche, and there's the special (which is twice as large as the others, and has... ground beef, cheese, ham, tomato, olives, and a boiled egg chopped in halves). Here in the picture you have a special cut open. We also have bolinhos de chuva - a literal translation would be "rain small cakes" but I think "rainy rolls" sounds better. They're made of a light dough of wheat flour, sugar, eggs and baking powder. Deep fried, then sprinkled with sugar and cinnamon. They are most often homemade - it's hard to find a store or market that has those for sale. Some of them are filled. And we have bolinhas de queijo (little cheese balls), or bolinhos de queijo, which are like coxinhas but round and made of cheese. Variants include those that have a breaded dough and creamy cheese in the middle, and those that are breaded cheese, doughless balls. A common staple of children's birthday parties. In the picture, it's the doughless variety. And risoles, which have a similar dough to bolinhas de queijo. They have varied fillings (cheese, ham and cheese, palm tree core, corn) and have a half-moon shape. They are also common in children's birthday parties. 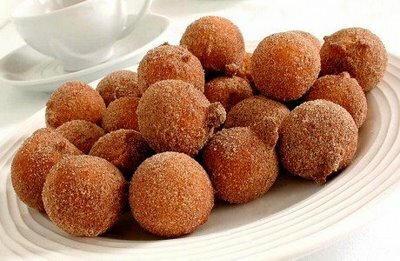 And sonhos (maybe they resemble malasadas? I've never had a malasada to know for sure). Bread-like dough, deep-fried, cut in the middle, filled with a sweet cream (often vanilla custard) and sprinkled with frosting sugar. They're commonly found in bakeries and places that sell baked goodies. And mandioca frita, or fried cassava root. It's something commonly found as an appetizer in pubs and some restaurants. And polenta frita, which is a fried dough made of corn and cut in the approximate shape of potato fries. Crunchy on the outside, soft and probably extremely hot on the inside. Be careful not to burn your tongue when you eat it freshly fried. And milanese provolone, which is breaded and fried provolone cheese. Deliciously crunchy on the outside, soft and melty on the inside. 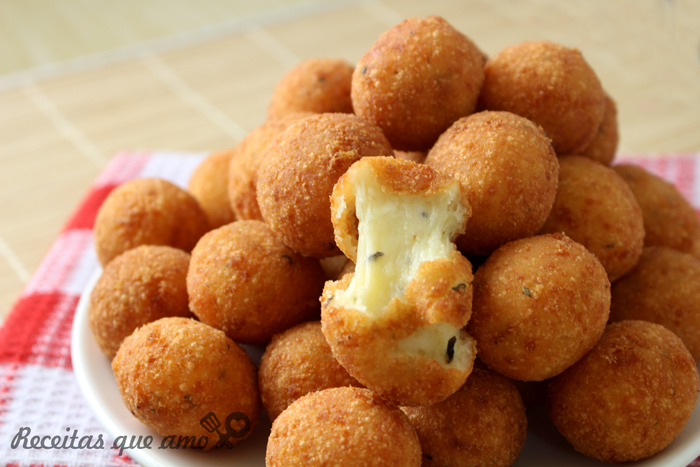 Differs from the doughless variety of bolinho de queijo due to having a cubic shape and being made of provolone, while bolinhos de queijo are often made with cheese that lack a strong taste, like mozzarella. And bolinhos de mandioca, which are like bolinhas de queijo but made with cassava dough. Some of them have a cheese filling, like the one in the picture. And bolinhos de bacalhau, codfish fried balls, which came over with the Portuguese and remained sort of a staple of fried goodies. I personally dislike codfish, but some people love it. 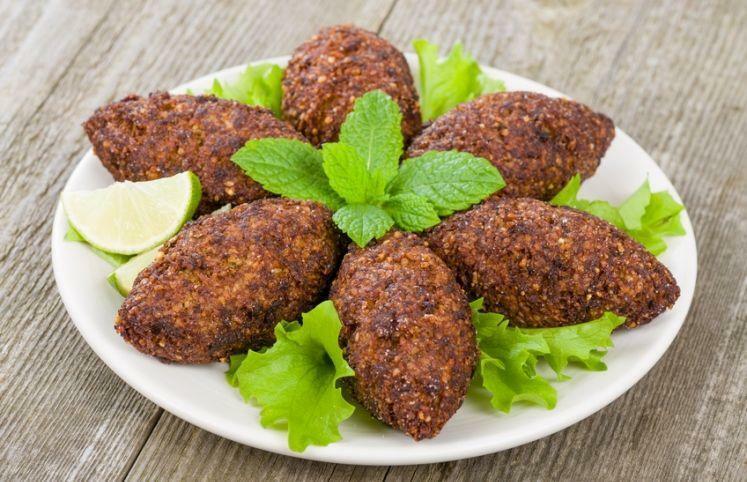 And kibes, which are common in Arab restaurants but that have gotten popular enough to be found pretty much every place that has fried goodies. They're made of ground meat and a special kind of wheat, specific for it. There's a vegetarian version made with eggplants in place of meat. And I'm not sure if I forgot anything else, but now you know the main fried foods we have here in Brazil. That is an awesome list Nic! I distinctly remember risoles, because we have a pair of Brazilian restaurants in Austin. One of them was right outside of the university. I had many, Brazilian friends at the university, in the aerospace engineering and mechanical engineering departments, on account that many were involved with Embraer. One of my Brazilian friends was of Chinese descent. He sometimes cooked Brazilian food, and we did a couple of barbecues together. I didn't know there were Brazilian restaurants in Austin! I thought they were more common in places tourists visit more, like Miami. Were they steakhouses, though? The few Brazilian restaurants I've seen when I went abroad were steakhouses, and they didn't look like the kind of place where I could get a risole. And what kind of food did your friend cook? Did he ever make brigadeiros? If that's any consolation, I don't eat almost anything on that list on a regular basis. I usually eat pastel once a week on Sundays, and that's about it (and it's common knowledge that pastel on a Sunday doesn't ruin anyone's diet). 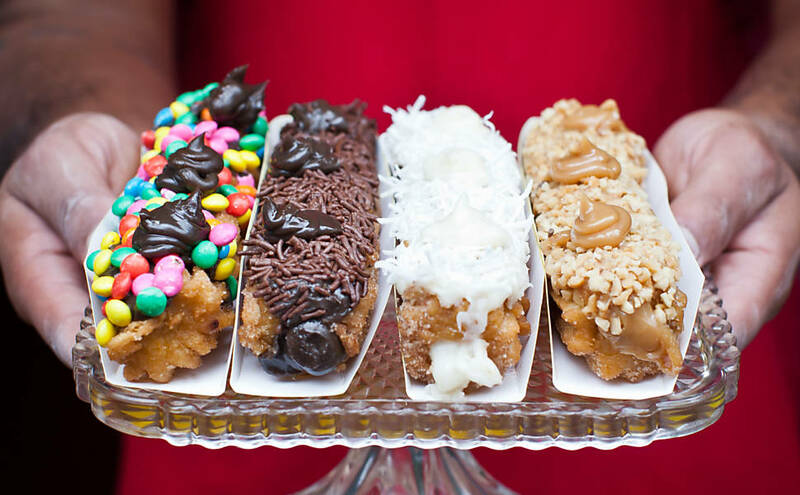 That being said, come to Brazil, we have those and many, many more kinds of diet-ruining food! One of them was a steakhouse, but the one next to campus was not. That's where I got the risoles. I think there's a third one started by the same owner of the one on campus. I'm not sure my friend was very much of a cook though, nor pastry Ryan* chef either, so I don't think I ever saw him make a Brigadeiro; he mostly stuck to grilled meat, I was the one who was doing most of the cooking for my family once or twice a year (Easter, Thanksgiving and Christmas), and I'm a cook of the French variety mostly and to a lesser extent Mexican food out of nostalgia..
*I don't know who "Ryan" is. That was my auto-spelling in my Android phone this morning. As with all fried bread, delicious, but is probably guaranteed to give you serious heartburn (acid reflux)... I can't express the pain I get after eating the Native American "Fry Bread." Don't know if this has been added previously, but we have, down under, the ubiquitous Chiko Roll! The Chiko Roll was developed by Frank McEncroe, a boilermaker from Bendigo, Victoria, who turned to catering at football matches and other outdoor events. In 1950, McEncroe saw a competitor selling Chinese chop-suey rolls outside the Richmond Cricket Ground and decided to add a similar product to his own line. McEncroe felt that the Chinese rolls were too flimsy to be easily handled in an informal outdoor setting and hit upon the idea of a much larger and more robust roll that would provide a quick meal that was both reasonably substantial and easily handled. The result was the Chiko Roll, which debuted at the Wagga Wagga Agriculture Show in 1951. A Chiko Roll's filling is primarily cabbage and barley, as well as carrot, green beans, beef, beef tallow, wheat cereal, celery and onion. This filling is partially pulped and enclosed in a thick egg and flour pastry tube designed to survive handling at football matches. The roll is typically deep-fried in vegetable oil. At the peak of its popularity in the 1960s and 1970s, 40 million Chiko Rolls were sold annually in Australia. The product has been described as an Australian cultural icon. As an aside, I grew up in Wagga Wagga and lived there for many years - Chico Rolls appeared on the menu on the odd occasion! I haven't had one for years, and despite modern healthier eating habits they are still quite popular, although they don't sell in multiple-millions as they used to. Chico rolls. Not popular here - but a meal graciously served up by blue uniformed men, to the cold and hungry woe begotten taking up the stark accommodations at the local police lock up. Well, if all those sheep aren't for eating, what exactly is going on over there...? So, hastily back to the Chiko.